This will probably be the last update of Thall Faceshooter’s adventures. 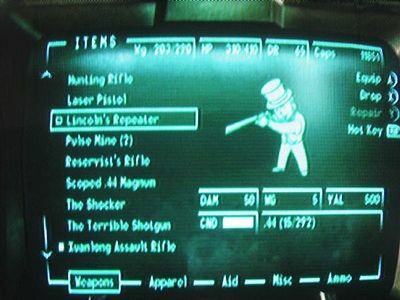 In the time since the last update he has managed to bring clean water to the Capital Wasteland. There are still things for me to do in game, including three of the DLCs, but I think today’s update will wrap up Thall’s story pretty well. I picked up Lincoln’s old rifle. Not only does it still work, it’s fantastically accurate. Despite the temptation to wear it around the wasteland, I sold his top hat to a historian. Using my VATS targeting system I can shoot grenades out of the air. I’m a god now. I broke into a vault full of virtual reality machines. When I sat down into the chair there I leveled up. I leveled up by sitting in a chair. Tunnel Snakes, Reily’s Rangers, Regulators, and the Brotherhood of Steel. Apparently I’m a joiner. Killing slavers is hard work, so I stopped in their armory. In the basement is a bed, so I took an hour nap. Feeling refreshed I came back out to kill some more. I took a bit more damage than I had wanted, so I went back in the armor and took another nap. The slavers were very patient and waited for me each time. In another virtual reality machine I’m commanding US troops in Alaska. I pick snipers to help me out on a mission. They charge the enemy. My sniper team charged the enemy! After the Alaska simulation I get a stealth suit that turns me into a Predator. Like the alien that Arnold fought, not the guy who hangs out in vans with no windows. The armor is awesome. Despite covering me head to toe, the first thing I do is put on my cowboy hat. 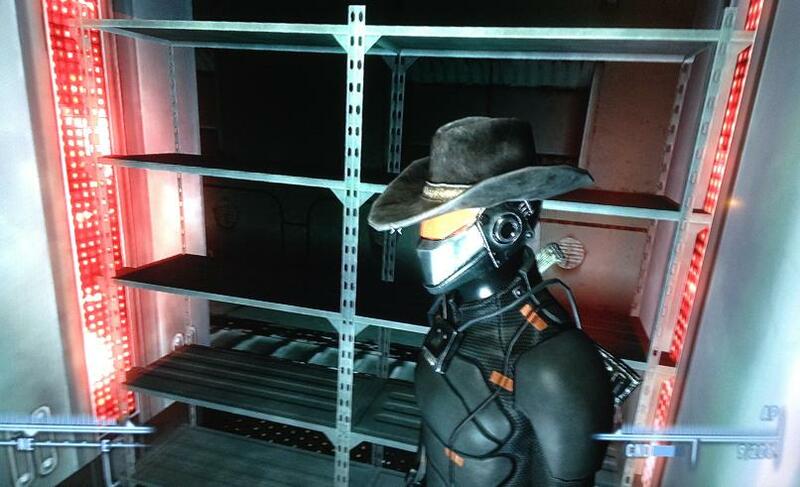 Daft Punk Cowboy, yee haw. There is a house next to a grave yard; kind of creepy. The house has a basement; extremely creepy. While exploring the creepy house a man surprises me by quickly coming around a corner. It surprises me and I react by shooting him in the face with a Chinese assault rifle. He had an eye patch, so we’re just going to assume he was evil. I’m trying to be a good guy and the game has to go and send me to a city full of annoying kids. You can’t shoot them. I debated leaving the place full of land mines anyway. 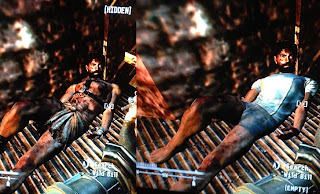 I just shot the head off a Raider who had the exact same face/hair style as me. It was a Skywalker moment. Headed to Pittsburgh to kill some slavers, I’m disappointed by the lack of Primanti Bros. So stripping the “Slave Rags” off of a slave actually leaves them wearing more clothes than they started with. There are lots of catwalks in the Pitt. Watching a bullet fly in slow motion across the open steelyard, pass between other girders, and finally split a Trog’s head in two is pretty awesome. Found a dead guy laying on two unopened medkits. He almost made it. Oh yeah along the way I restored clean drinking water to the area and took out the main group of bad guys. I guess that is important too.